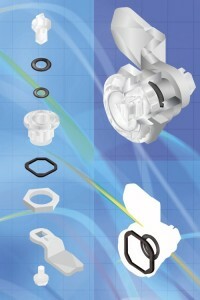 Our well proven 1000 series of quarter turn locks has a significant upgrade – customers may now order the IP66 option, with the result that panel builders can readily achieve higher sealing specifications for completed cabinets – a requirement for food processing industries and outdoor installations so as to protect against driving rain and hosing-down with power washers. The sealing upgrade is achieved by use of additional internal “O” rings and a door mounting seal, these ensure ease of operation, as well as improving sealing. The IP66 upgrade may also be used either as a retrofit installation or in production by stocking the standard IP65 lock type for general use and then specifying the IP66 kit for hasher environments. Click for further information. Share the post "IP66 upgrade for 1000 series quarter turn locks"